What’s YOUR biggest “fear factor?” Heights? Snakes? CLOWNS??!! Whatever your phobia, it can be paralyzing! To overcome our fears, we can expose ourselves to them bit by bit. But it’s a slow process. Enter a research group led by David Watson from Brighton and Sussex Medical School. They believe there’s a faster way to conquer your fear. By getting to the HEART of it! According to the team, we experience stronger feelings during a heartbeat. This means feelings like fear will be intensified during the thump in our chest. 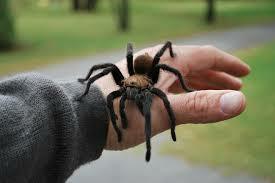 To test out their theory, they monitored the heartbeats of over fifty participants with arachnophobia – fear of SPIDERS! Patients saw pictures of spiders on computers. One group was exposed to the images IN SYNC with their heartbeats. A second group saw them BETWEEN heartbeats. Results? ALL subjects reported improvement as expected with general exposure over time. However, those who saw spiders synched up with their heartbeats felt GREATER relief. The researchers think it’s because their fear was amplified. Conquering your phobias? Just listen to your heart. And avoid the circus!